The forces of globalization coupled with large strides in technological development have made it possible to think of the world as our backyard. With ‘time-space compression’ (Castells, 1997, p. 434), travel is a much friendlier notion, and people are challenged with the idea of global citizenship and multiple identities. 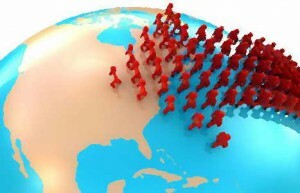 These multiple identities often stem from increased immigration to countries such as the United States creating a higher level of multi-culturalism and biculturalism. With this increased diversity in the national population, there are new challenges for many of its citizens such as coming to terms with hyphenated. Increasingly within the college and university curriculum in the U.S., there is a greater emphasis on study abroad as a means for learning first hand the skills necessary to function in an era of globalization. While there has been frequent discussion of study abroad as a way to widen horizons and become more culturally aware, there are still many avenues that have not been adequately studied. One such avenue is the effect of study abroad on identity development in heritage learners. Heritage learners are students who choose to study abroad on the country of their ethnic origin. As more and more students in the United States find themselves navigating through the ‘borderlands’ of two cultures, many have turned to studying abroad in the country of their ethnic origin as a means to help reconcile some of the issues bicultural individuals face. This paper aims to answer the following questions: 1) To what extent are the experiences of different groups of Asian-American heritage learners similar or different? 2) How does the study abroad experience affect identity development in Asian-American? Using identity theory as a foundation, there is insurmountable psychological importance in understanding ones ethnic identity and the fact that ethnic identity plays a critical role in the concept of self (Phinney, 1990). When dealing with hyphenated Americans who must navigate through both the mainstream American culture, and the culture of their ancestry, the question evolves into whether individuals must choose between two conflicting identities or can establish a bicultural ethnic identity (Phinney, 1990; Huang & Yeh 1996; Lee 2002). Phinney’s 1990 chart of comparing different identity theories proves to be an excellent illustrative representation of the major ethnic identity development stages. While each of these theorists provides a strong model for ethnic identity development, for my purposes, I will draw from Cross (Black identity development), Kim (Asian American identity development), and Phinney (identity development that moves beyond specific ethnic groups). Charles Horton Cooley’s concept of the ‘lookingglass self’ (Cooley 1933, p.121) is also important when deconstructing notions of the self and other. Using a qualitative framework based primarily on interviews, results have shown that the study abroad experience challenges Asian-Americans to rethink their notions of what is self and other and is a critical turning point in ethnic self identification. Results have also shown that study abroad is an integral part in internationalizing education in the United States to better accommodate dynamic multicultural student populations.